Are you bored by the usual Christmas routine of over-eating and family tension? Our Christmas week is a relaxing and fun time with a focus on yoga, inventive cuisine, walks in the sunshine and laughter with new friends. The program includes 3 delicious vegetarian meals per day and a comprehensive yoga course led by our experienced in-house teachers, plus two days of guided hill walking in the beautiful Sierra Nevada and Alpujarra region. The food at Kaliyoga will delight and amaze you. Our Mediterranean-inspired vegetarian cuisine is light, gluten free, vegan/coeliac friendly and absolutely delicious. And with three copious meals per day, you will never go hungry. If you have an allergic intolerance to specific foods, we can accommodate your needs. Under the expert guidance of our in-house yoga teachers, you will discover that yoga can be a tool not only for improving health and fitness but also for deep rest and mindful relaxation. During the week we give you confidence to build a self-practice that you can take home. Our yoga method can be applied to all styles of yoga because, rather than focusing solely on stretching and shape-making, we teach you to balance your physical stability and strength with mindful tranquility. 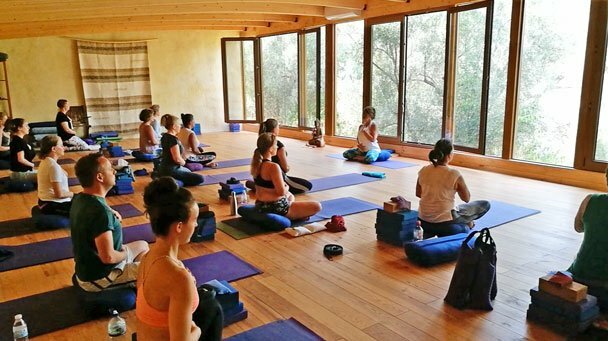 Every morning there’s a 2-hour yoga asana class and in the evenings a restorative yoga class (1.5 hours). For early risers there’s a guided meditation before yoga. The week culminates with a fun partner yoga session on Friday evening and a self-practice session on Saturday morning. Everyone is welcome, whether novice or experienced. You are welcome to use the outdoor facilities at any time: infra-red sauna, outdoor swimming pool, read in a hammock, catch up on some guilt-free sleep, or go for a local walk in the beautiful Silent valley. If you need more sleep and want to miss a yoga class, that’s fine too. We are delighted to introduce you to our hand-picked team of world-class holistic therapists, available every afternoon to attend to your needs. They can help you to free yourself from whatever might be holding you back; and most importantly of all, the powerful combination of yoga classes and holistic therapy sessions re-connect you with the wonderful person that you really are, rather than who you think you ‘should’ be. When you return to Kaliyoga, you will be eligible for a free holistic relaxation session with the therapist of your choice, subject to availability. Evenings can be quite social, though if you prefer to be quiet, that’s ok too. There is a warm sitting room with a cosy snug to curl up in and relax with a good book; or why not go for an evening stroll in the countryside, or stroll into town (about 20 mins on foot). 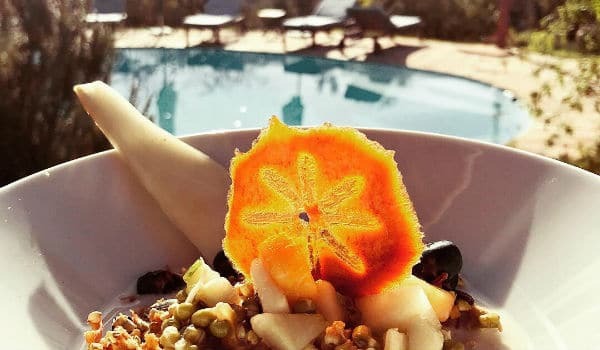 Kaliyoga is located 10 minutes from the market town of Orgiva where you will find whole food & hippy shops, cafes and a bustling outdoor market on Thursday mornings. 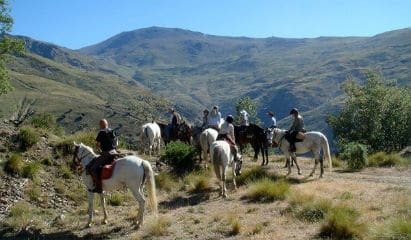 There is also horse riding, great mountain walks, Moorish white wash villages, beautiful beaches (35 mins drive) and paragliding for the adventurous. We are 50 minutes from the glittering Moorish city of Granada with its Alhambra Palace and Gypsy Flamenco quarter. 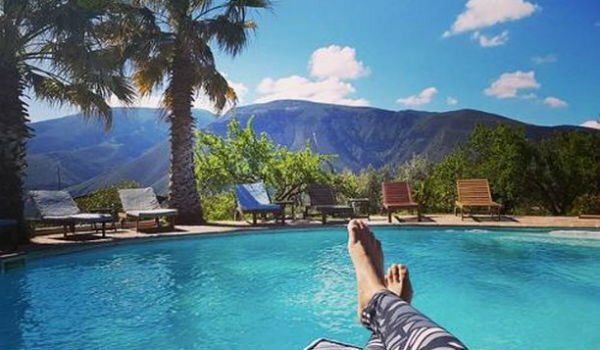 Kaliyoga (Spain) is located in southern Andalucia between the Alpujarra hill towns of Lanjarrón and Orgiva, surrounded by panoramic views of the Sierrra Nevada mountains. We are approximately 1.5 hrs by car from Malaga airport.